Need help making your veterinary clinic more feline-friendly? Join us for a free VETgirl online veterinary continuing education webinar thanks to sponsorship from Merck Animal Health! In this interactive, 2-hour lecture, Dr. Susan Little, DABVP (Feline) will help veterinary professionals make simple changes that any practice can implement to reduce stress for cats and cat owners. The result means calmer cats, happier cat owners, safer veterinary staff, more effective medicine, and increased feline business! For additional information, you can also check out Dr. Little's Veterinary Focus Magazine article, "Why focus on felines in your veterinary clinic?" How Do I view February 15th webinar? Hi Alissa – ALL VETgirl webinars are given live, but then recorded, archived, and placed in the VETgirl library for viewing at any time. 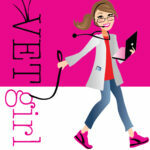 VETgirl ELITE subscribers have the freedom to view the webinar at your convenience. Loved this webinar, very helpful information that I will definitely incorporate into my practice. Is it possible to download slides from the webinar to facilitate sharing ideas with clinic staff? Hi Lisa – the slides are available for our VETgirl ELITE members – thanks! Great webinar! Can’t wait to implement some of these into my practice!